Voter polls show the ups and downs of Norway’s parties since the last parliamentary elections in 2013. Data: Response, Kantar, Norstat, Ipsos, Infact, Sentio, Norfakta, Perduco, Gallup. Figure by authors/Monkey Cage. Instead, Labor proposed to reverse two-thirds of the $2.6 billion in tax cuts and increase taxes on the wealthy, while the Conservatives want further income tax cuts. With growth picking up, Labor’s strong hand on the key question of economic management is weakening. Indeed, the Conservatives are now considered the best party on jobs. Labor and the Conservatives remain locked into a primarily economic tug-of-war, which the Conservatives are winning. Instead, the Progress Party has become increasingly tangential as voters have focused on Labor and the Conservatives as the obvious sources of solutions to Norway’s economic headaches, while looking elsewhere, not least to the Center Party, for an anti-elite choice. The only exception to this was a sudden shot in the arm in late 2015 after the most acute phase of the migration crisis. Afterward, as public concern about incoming migrants faded, the Progress Party gradually returned to its prior polling levels. Progress politicians have revisited the immigration issue but headline-grabbing publicity stunts have seemingly fallen flat in the campaign. The result of the referendum cannot solely be interpreted as support for anti-establishment politics, represented by the M5S and Lega Nord, but there is a chance that one of the main implications will be that both parties are strengthened. Voters opposed the reforms for a number of reasons. Surveys indicated that a large number of voters were unsure of what the reform package actually entailed. The strange constellation of issues in the reform, as well as the odd elite alliances on both sides, made the whole campaign complex. Adding insult to injury, the most frequently shared news during the campaign, suggesting voter fraud, turned out to be false. Another frequently shared false news article claimed that Matteo Renzi’s own wife, Agnese, had decided to vote no. This lack of clarity in the reforms and during the campaign, in addition to reasonable critiques of the design of the reforms, probably made more voters lean toward the status quo. However, although the reasons for the No victory are numerous, the result may be that the M5S and Lega Nord, two of the most outspoken and widely covered actors in the No campaign, emerge strengthened, at least in the short run, by the surprisingly wide margin of the No victory. This ensures these two parties have a stake in calling snap elections. The Renzi government has already passed a change to Italy’s electoral law, the Italicum, providing an automatic majority of seats in parliament for the winner of the next election. Having designed the Italicum to work alongside the constitutional changes that were rejected with the referendum, the PD will now want to change the electoral law back to a proportional system. Yet if elections are held before that, the M5S could profit from a reform they vehemently opposed just over a year ago. Published at the LSE Europp Blog, 1 November 2016. On 4 December, Italian voters will go to the polls to decide on what would be the country’s most significant set of constitutional reforms since the birth of the Italian Republic in 1946. Indeed, the reforms would overhaul around a third of the constitution’s articles, ending the ‘perfect bicameralism’ in which both legislative houses have equal powers by significantly weakening the Senate, as well as reducing the latter’s membership from 315 to 100 and more clearly delineating power between Italy’s central and regional layers of government. Alongside an already approved electoral reform that, amongst other things, allocates bonus seats to the largest single party, the net result of these reforms would be an empowered government free of the unique burden of maintaining the confidence of two chambers and probably less reliant on the support of Italy’s many minor parties for forming coalitions. Critics of the reforms have argued they will create an overly powerful executive, wrangling over legislative procedures, and a Senate packed full of regional representatives who should be concentrating on their day jobs. Despite the radical nature of the proposals, Prime Minster Matteo Renzi had initially expected to pass his sweeping measures with two-thirds of both houses, enough to avoid needing approval by a referendum. However, after Berlusconi’s centre-right Forza Italia party – ironically, long-time supporters of constitutional reform – withdrew support in February 2015, Renzi could only obtain a simple majority of Senators. Despite the setback, Renzi remained confident that, when faced with an opportunity to finally have stable and effective government, the Italian electorate would vote in favour. Early polls indicated overwhelming positivity among Italians toward the constitutional reforms, yet support for the changes has been on a downward trajectory ever since, as shown in Figure 1 below. At least one factor explaining Sì’s decline is the falling popularity of Renzi himself, whose youthful confidence was initially welcomed by exasperated Italians. Though Renzi has taken pride in enacting reforms for future growth, his approval ratings have slipped from 70 per cent to 40 per cent in the face of a weak economic recovery and high youth unemployment, indicative of ‘economic voting’, whereby leaders are judged by economic factors. As shown in Figure 2, the popularity of Renzi’s Partito Democratico (PD) and Sì fell in unison throughout 2015. In late 2015 Renzi attempted to bolster support by tying his political career to an affirmative referendum result. This strategy is now widely seen as a mistake. 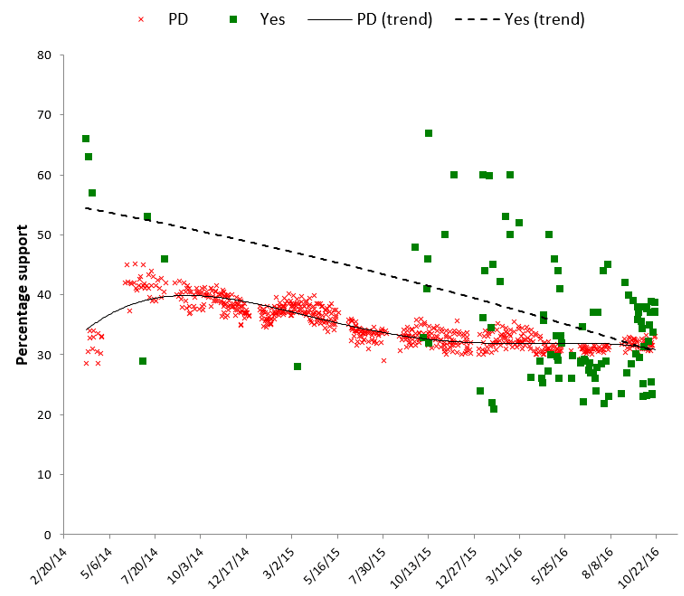 Since then PD support has remained stable while support for Sì has continued to plummet as all but Renzi’s admirers have been given reason to rethink their initial enthusiasm for the reforms. In this sense, the referendum has become more a vote about the Prime Minister than the constitution. In response, Renzi’s government has attempted to shore up support for Sì by recently passing a budget billthat allows Italy to kick its fiscal obligations down the road and hand out rewards to key socio-economic groups prior to the vote, a risky strategy to which Italy’s fiscal authorities in Brussels and Frankfurt seem willing to turn a blind eye for now. Partially in an attempt to emphasise Renzi’s ‘original sin’ of having come to power without election, his opponents have argued that the constitutional reforms would represent further disempowerment of the Italian electorate. Indeed, when Berlusconi, who himself pushed for constitutional reform as Prime Minister, announced his support for the No campaign, he stated ‘the victory of No will mark the beginning of a new political season in which Italians finally can decide again.’ Berlusconi originally agreed an informal pact with Renzi whereby the media mogul would support the Prime Minister’s reforms in exchange for a favourable presidential candidate, yet announced his opposition to the amendments after arguing that Renzi had reneged on his side of the bargain. Beppe Grillo, whose populist Five Star Movement has risen in the polls from around 18 per cent in 2015 to parity with the PD at 30 per cent today, is more emphatically opposed, stating in late August that ‘today No is the most beautiful and glorious form of politics. Whoever does not understand that can f**k off’. He later tweeted ‘the referendum is an incomprehensible mess. Let your gut feeling decide.’ Ironically, one of the arguments put forward by No is that the reforms would offer few checks and balances should a populist figure like Grillo come to power. The Lega Nord, who appeared to be fading out of the party system following a 2012 corruption scandal and whose traditional focus has been Northern regionalism, have also experienced a considerable increase in support since 2014 having switched their focus toward Euroscepticism and opposition to (particularly Islamic) immigration. The party’s leader, Matteo Salvini, has framed the referendum as Italy’s ‘Brexit moment’, tweeting ‘Thank you Great Britain, next it is our turn’. Though commentators have been as keen as Salvini to frame the Italian referendum and Britain’s EU referendum as equivalent expressions of anti-establishment sentiment, there are major differences. First, British attitudes to the EU had been stable for some years and the effects of that campaign, despite claims of its nefariousness, are likely to have been limited. By contrast, attitudes to Renzi’s reforms have varied greatly, both declining in approval across time as well as fluctuating wildly between contemporaneous polls. Underpinning these opposite dynamics are the contrary drivers of vote choice in each referendum. Whereas socio-demographics and long-standing beliefs concerning sovereignty and immigration were the foundations of British voting patterns – making them highly stable and resistant to campaigning – Italian attitudes toward the relatively non-ideological reforms proposed have been driven more by ‘party cues’ in a particularly unstable party system. 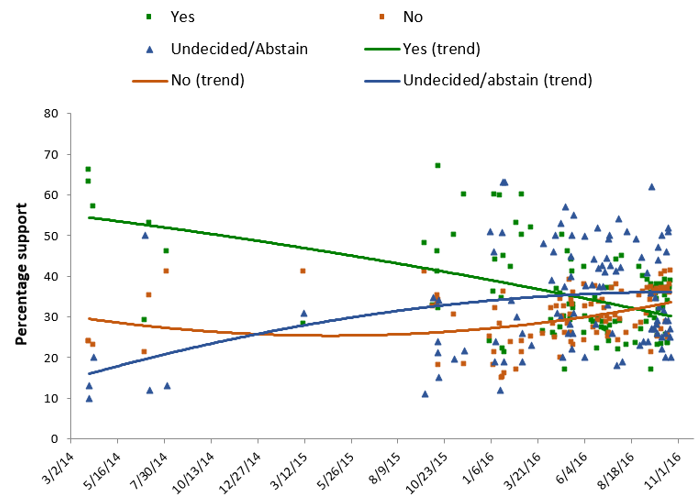 As we can see in Figure 3, referendum vote intention is divided sharply by party choice. 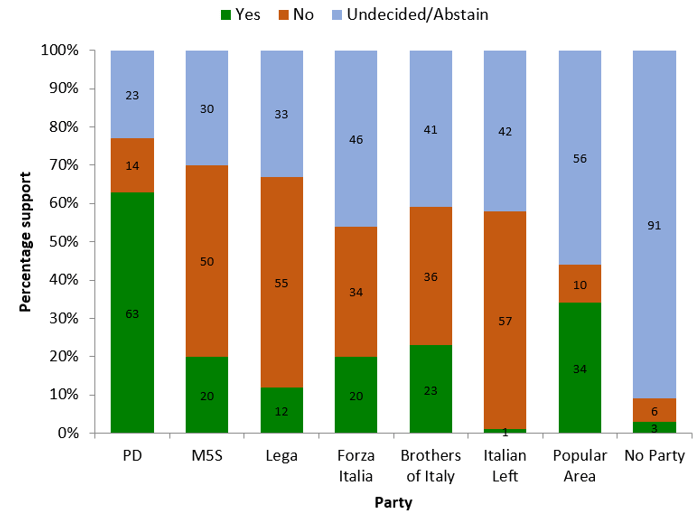 Moreover, planned abstention or remaining undecided is considerably lower among those with a party preference than the nearly one half of the Italian electorate currently without one. The relative ambivalence of Forza supporters, who have seen their leader flip-flop over the issue in the last two years, mirrors the uncertainty felt by much of the electorate and exemplifies the tendency of voters to drop out of political participation when faced by “cross-pressures” – multiple beliefs, incentives or partisan allegiances that have opposing causal effects on their vote choice. On one side is a centre-left Prime Minister who is in coalition with two minor centre-right parties proposing a historically right-wing initiative with the backing of business groups. On the other is an even stranger set of bedfellows, including the ambiguous populists in the M5S, the radical right Lega Nord, the far right Fratelli d’Italia, the wavering Forza Italia, and the Greens and communist parties. Furthermore, Renzi has experienced considerable opposition from left-wing sections of his own party, who have been more vocal than the faded Berlusconi, as well as from trade unions, both of which resent the PD’s recent rightward shift. The broad package of reforms makes the referendum both technically complex and liable to include a mix of proposals that voters are both in favour of and are opposed to. Indeed, a recent poll showed that only 17 per cent of voters feel that they understand well the issues at stake, while 46 per cent feel they understand the proposals only superficially and 37 per cent do not understand them at all. If that were not enough, the referendum has largely been treated as part of a broader package, which includes the already passed – though still contentious – electoral reform. Finally, by tying his political destiny to the referendum’s result, Renzi, the career politician, has opened up additional dimensions of the contest regarding attitudes toward the government, the country’s political elite, and even Italy’s relationship with Europe – including the single currency and the migration crisis, at a time when the country’s historic pro-Europeanism is waning. 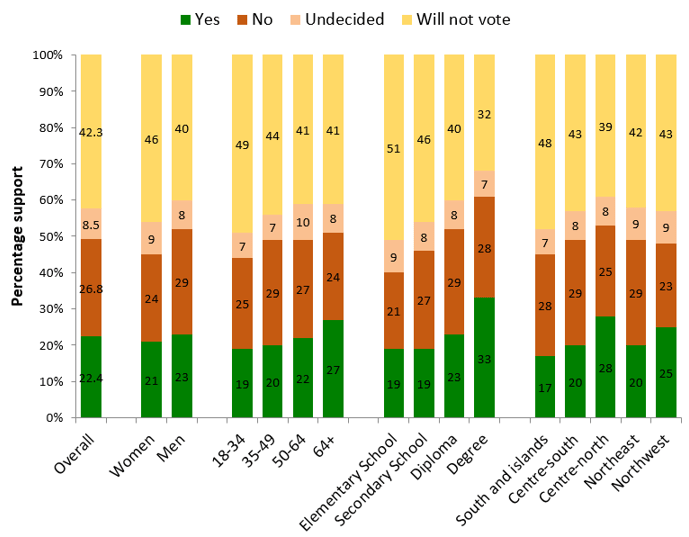 As a result of these cross-pressures, and as shown in Figure 4, the most popular electoral choice of every socio-demographic group except degree-holders is abstention. Socio-demographic factors do a fairly poor job of predicting vote patterns in this referendum. Indeed, excluding undecided voters and abstainers, none of the socio-demographic groups that we consider have more than a 60 per cent majority in favour of either Sì or No, with the sole exception of those living in the South and Islands. The only socio-demographic groups which show majorities in favour of the reforms – notwithstanding undecided voters and abstainers – are the over 64s, those with a university degree and those in the Centro-nord of Italy, which includes Renzi’s home region of Tuscany. The larger share of No voters among the younger groups is partially a reflection of the discontent that many young voters feel about the PD’s gerontocratic practices, leading to significant vote shifts towards the M5S. In order to overcome the electorate’s growing dislike of Renzi, undermine No’s anti-establishment arguments, and circumvent voters’ uncertainty over the technicalities of the reforms in time for 4 December, the Yes campaign will have to mobilise Italians’ distrust of the political class. 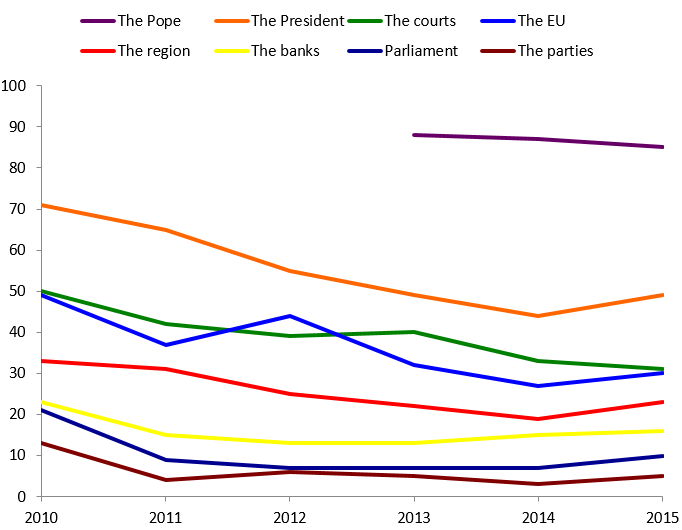 Italy already has a very low rate of trust in politicians – a 2015 survey found that only 10 per cent trusted the Parliament and 5 per cent the political parties, which is nothing new (see Figure 5). Furthermore, a recent experiment showed that participants were more likely to agree with the constitutional changes when primed with the argument that it would lead to fewer parliamentarians. However, participants were less likely to support the referendum when primed with “Renzi” or his party. In other words, Renzi may still succeed in convincing the population to back him, as long as they do not believe it is him they are backing. This strategy is already being increasingly employed by the Yes campaign, whose marketing is more and more focused on reducing the numbers and salaries of parliamentarians – in other words, “vote for us, to have fewer of the likes of us”. Turkey’s Gezi Movement: Did it change anything? In the 2013 Gezi Protests, more than 2,5 million people went to the streets. They demanded that the government would immediately restore true democracy, improve their human rights record, and protect urban green areas. It was by far the biggest wave of demonstrations in Turkey’s history, and was widely perceived as a political earthquake. But what practical changes, if any, did these protests bring about? In this post I show some preliminary results of my attempt to find ways in which the protests influenced practical politics. I compare the budget allocations to green spaces and cultural institutions in those Turkish Metropolitan Municipalities where there was a large number of protests during the Gezi events to those where there was little or no protests. The first figure below shows these allocations in the municipalities with a lot of protests. Three of the municipalities (Istanbul, Izmir, and Adana) saw a sharper rise in their allocations to green spaces and cultural institutions from 2013 to 2014 than in the previous years. In Eskişehir and Ankara, this increase occurred the year after, in 2015. As we see in the figure below, the positive trend in allocations to green areas and cultural institutions in figure 2 is not shared by municipalities that did not have large-scale protests during the Gezi events. The figure below shows the combined average growth of these allocations in the two years after the Gezi protests as compared to the three years before the protests for both the protest and non-protest municipalities. While the non-protest municipalities allocated less money to green spaces and cultural institutions after the Gezi protests compared to the three years before (an average decrease of -1.4 percentage points), protest-ridden municipalities increased these allocations (an average of 2 percentage points). Interestingly, three of the five municipalities that increased their budget allocations after the Gezi protests were lead by parties that were outspokenly against the Gezi protests and what they stood for. Still, the increased budget allocation took place also in these municipalities. This might indicate that protests represent a disruption to parties daily territorial control. Incumbent politicians may have increased spending to please protesters, regardless of whether their party agreed with this policy in principle. If we assume that social disruption is equally undesirable for all incumbents, regardless of party-related factors, even movement-hostile parties may have given concessions to the movement, regardless of their own ideological views. To be sure, the number of observations are too few to confidently establish any causal relationship between the Gezi protests and changes in budget allocations. Yet the tendency is interesting. I am currently working on collecting additional data to expand the number of provinces included in the study, in the hope that this will help us understand better when and whether incumbent parties respond to movement demands.